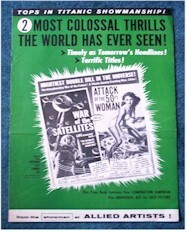 This is a major vintage Sci_Fi classic from 1958. Posters sell for thousands $$!!! 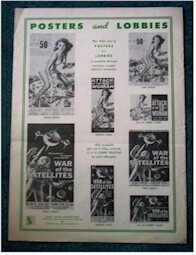 A one sheet sold for $6000 at auction in 2000 (Re: 2000/2001 Poster Price Almanac). This title is very rare to come by, you just don't see posters and lobby cards very often. 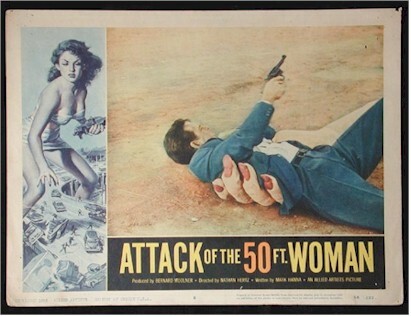 Furthermore, most of the lobby cards in this title do NOT show any part of the giant woman, here you see her scooping up a man with her giant hand in one card and the other picking up a car!! Look at the awesome border art!!! Don't miss out!!! RARE Pressbook from this highly desirable classic. 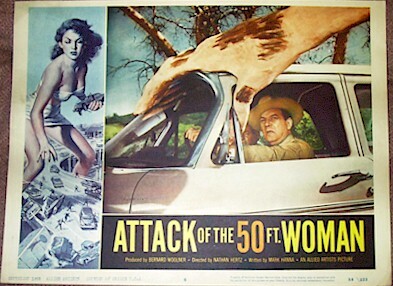 Back in 1958 the studio combined the campaign books for the release of two sci-fi movies, "Attack of the 50ft Woman" and "War of the Satellites".